The most recent forms of e-participation seem to provide new issues that need to be discussed. One such discussion involves the role of GIS. Can an ethically aware GIS be conceived? What does it mean for a GIS to be ethical at all? Throughout this paper, first the authors create a theoretical framework to encompass four key elements that lead us to the definition of ethical digital mapping: GIS ethics, social justice, power, and participation. Then they introduce the concept of PPGIS (Public Participation GIS), and argue that only a ‘qualitative turn' can enhance their importance in decision-making processes. Finally, the authors discuss an experiment that is currently taking place in Palermo, Italy, to debate the opportunities qualitative PPGIS may grant. This paper is the result of the joint researches of a geographer and a planner1, and it focuses on a topic that is by itself at the threshold between GIScience and ethics. Such assumptions could seem to lead the paper on a dangerous track, as these themes definitely deserve disciplinary-specific discussions. However, we believe that the key question of what can be called ‘ethical e-participation’ requires first and foremost an interdisciplinary (Albro & Richardson, 2012; Richardson, 2013) and thorough reflection on ethics in planning, and “ethics is hard stuff, as Socrates realized and ethicists ever since have understood” (Koch, 2006, p. 4). Despite some recent progresses (Campbell & Marshall, 1999; Sanyal, 2002; Watson, 2003 and 2006; Hendler, 2005; Campbell, 2006 and 2012; Lo Piccolo & Thomas, 2008 and 2009), researches on ethics within the planning discipline can be still considered a niche; yet, some scholars in the past produced interesting analyses, though mostly based on the Anglo-American context (Klosterman, 1978; Howe & Kaufman, 1979; Kaufman, 1981; Howe, 1990 and 1994; Harper & Stein, 1992; Hendler, 1995; Campbell & Marshall, 2000). Other disciplines cognate to planning—such as the built environment disciplines (Wilkinson & Morton, 2007), geography (for a critical view on these positions see Smith, 2000; Valentine, 2005; Askins, 2008), or public administration studies (see Brainard, 2003 for an analysis of citizen organizing related to health care issues; Calista & Melitski, 2007 for some critical comments on the use of ICTs in public administration; Roman, 2013 for his five major critical questions on e-government ethics)—have proposed more readings and insight on this subject (Lo Piccolo & Thomas, 2009, p. 2). 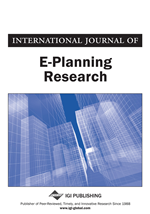 Still, we believe that the combined and interdisciplinary use of planning, geographic and other scholarly literature can help us further the debate on what ethical e-participation is, or should be. After all, geography and planning are each other’s alter ego (Phelps & Tewdwr-Jones, 2008). Moving from the field of generic planning-related ethics to the arguably even more complex fields of e-participation (Buchanan, 2012) and GIS-related ethics, we think that new and upcoming issues need to be addressed, and questions have to be raised. First, can an ethically aware GIS be conceived? What does it mean for a GIS to be ethical at all? How does this relate to planning research, and which particular approach to ethics should it emphasize? Last but not least, if we try to adapt the general idea of what e-participation should be to some local experiences, which show the complete absence of any collaborative approach from local institutions, how should we construct and apply any form of (e-)communicative ethics? How can we conduct an ‘inclusive’ research in such a context, starting with contradictory (or weak) requests by either institutions or disadvantaged groups?